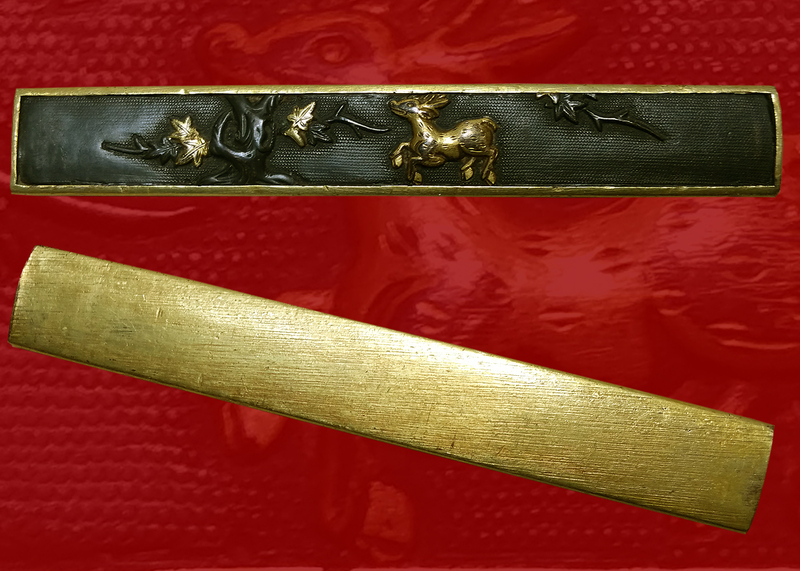 fantastic early Shinto katana, this sword is reminiscent of old koto work. 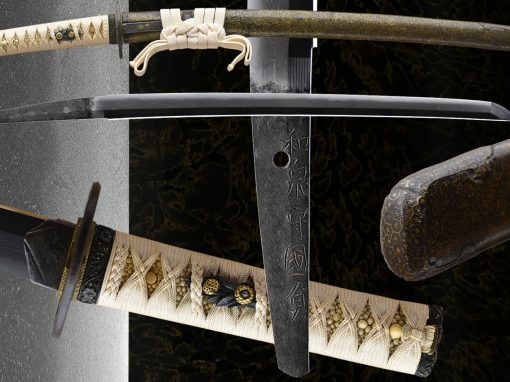 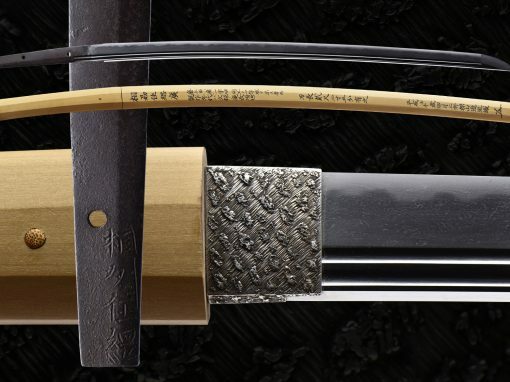 The blade is a signed piece with spectacular hada and a vibrant hamon. 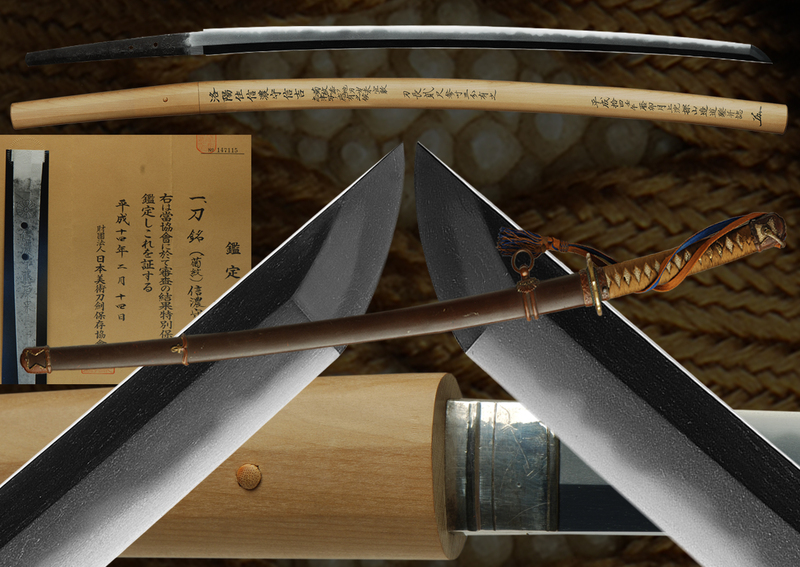 It is signed and Ubu, a long sword at 27-7/8″. 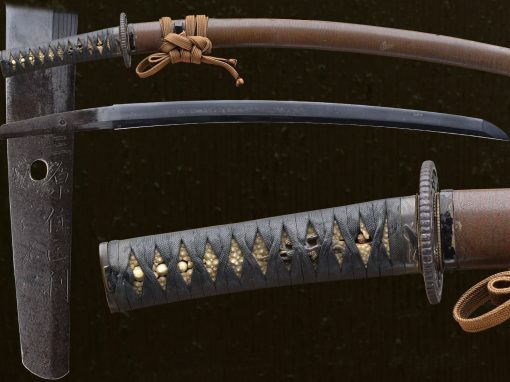 This blade is a true beauty. 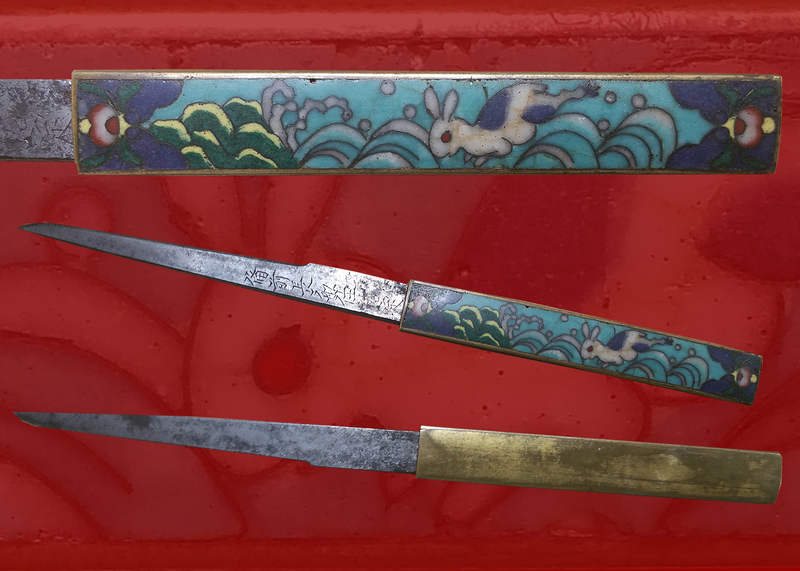 The hada is a well worked Mokume with Itame and covered in ji-nie . 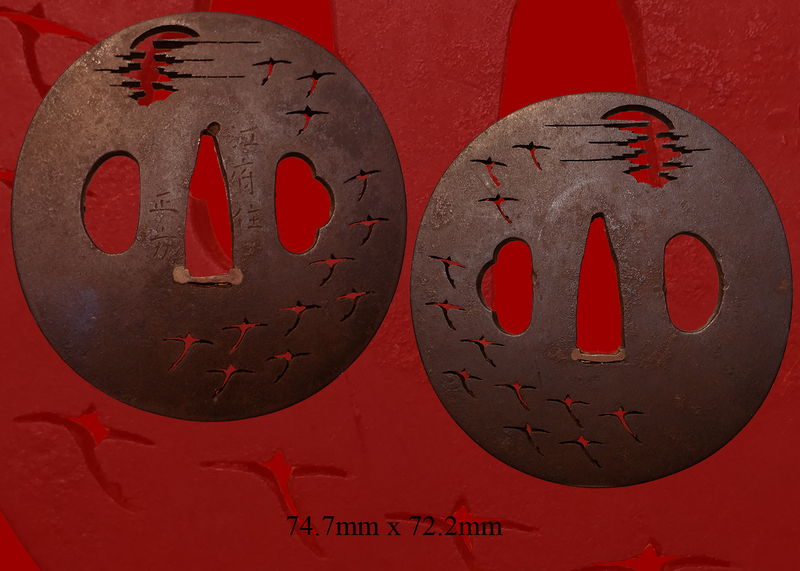 There is chikei and much nie all over. 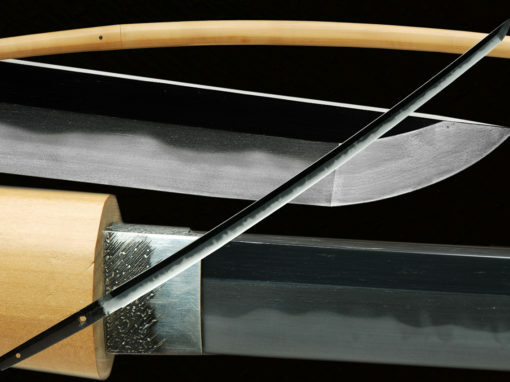 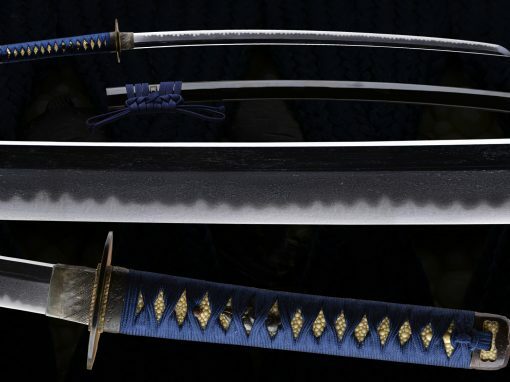 The hamon is made up of a gunome base in notare with small clusters of nie the length of the blade. 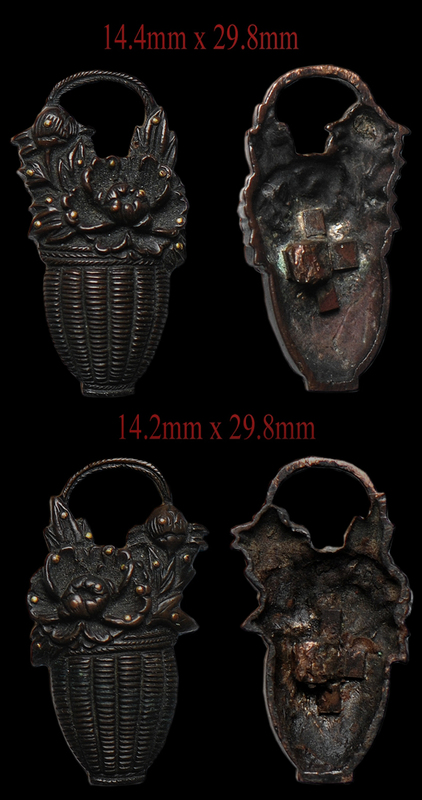 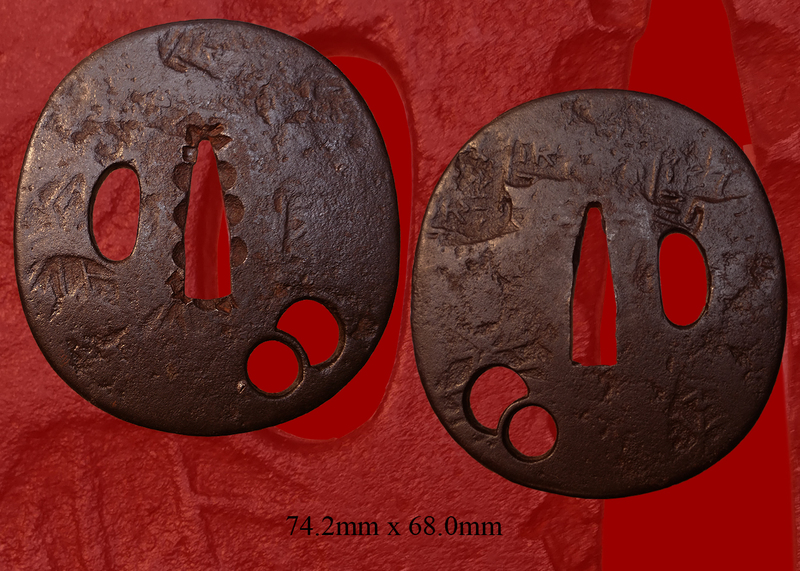 There is sunagasi and kinsuji as well as ko-nie. 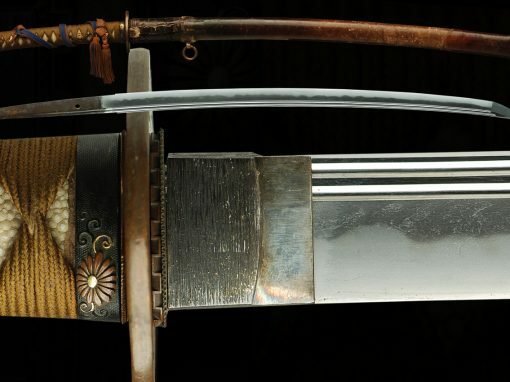 An impressive sword with much to appreciate. 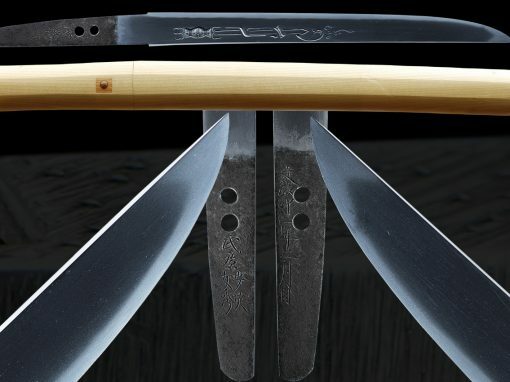 The Quintessential Shinto era Japanese Samurai sword, this blade is ubu and maintains the original signature and attributes. 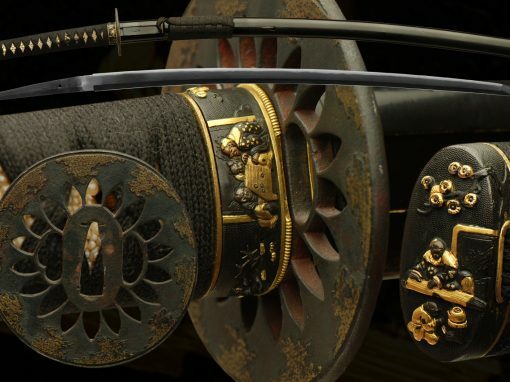 The blade comes with original military mounts. 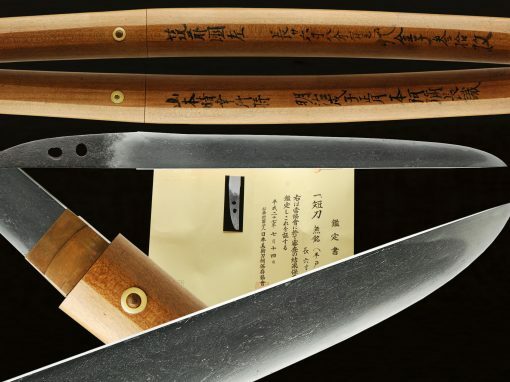 It also has a Shirasaya with sayagaki from Tanobe-San of the NBTHK. 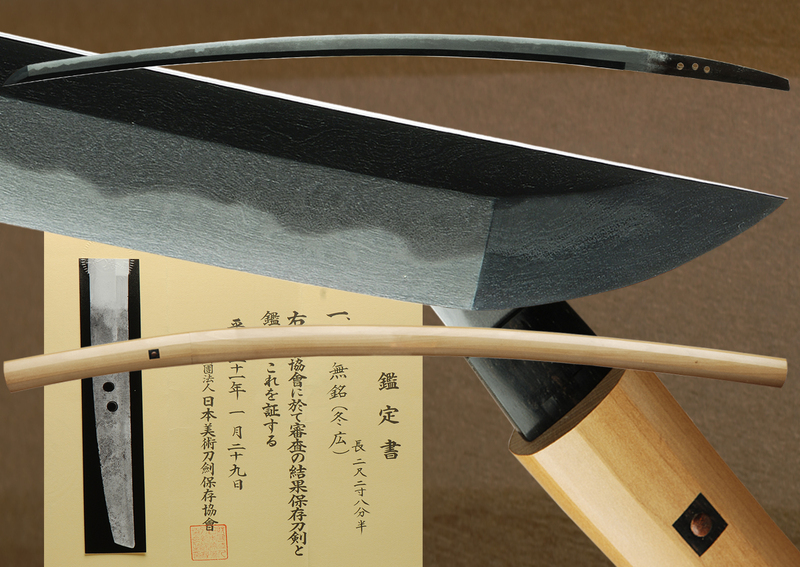 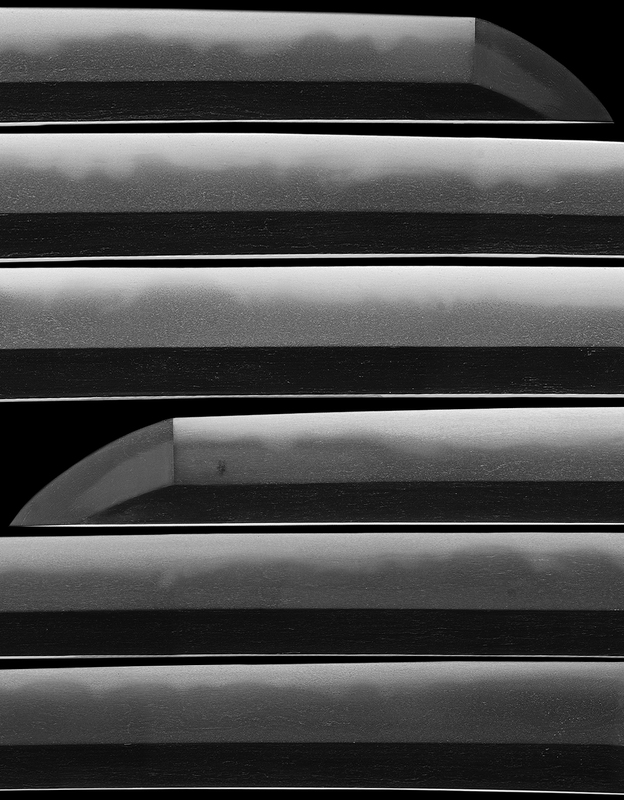 The blade itself is an exciting blend of Notare and Gunome with a beautiful thick frosting of nie and nioi. 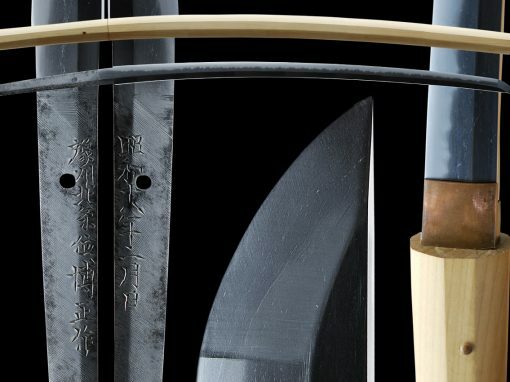 The itame hada is tightly forged and very well made. 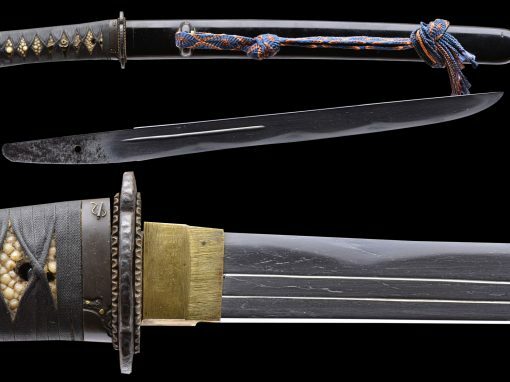 He is also called Takai Kinsaburô, and he also lived in Osaka. 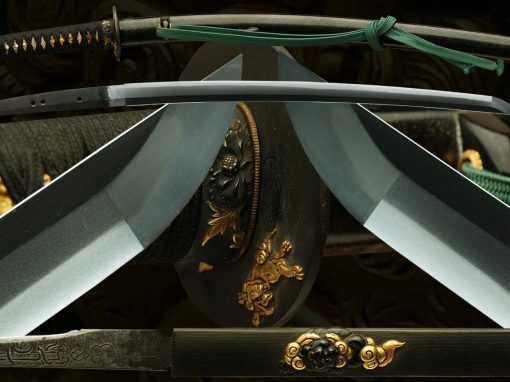 At first he called himself FUJIWARA, and he later changed to MINAMOTO. 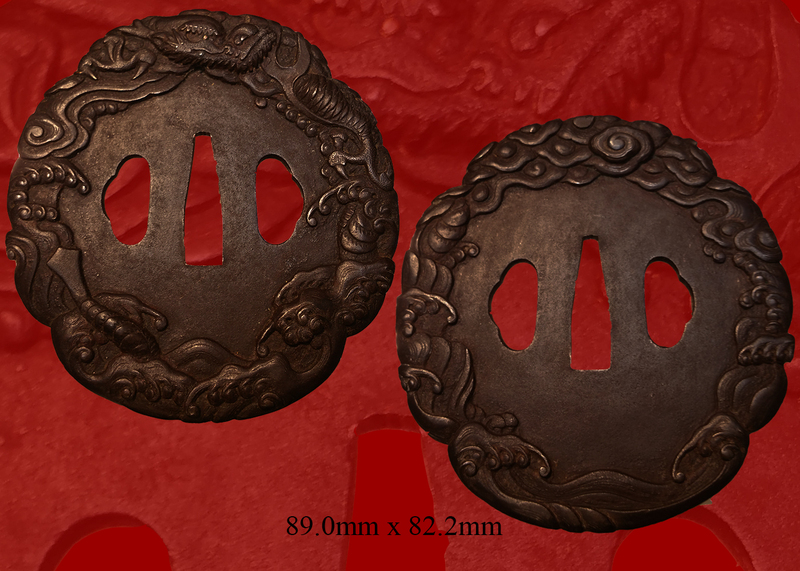 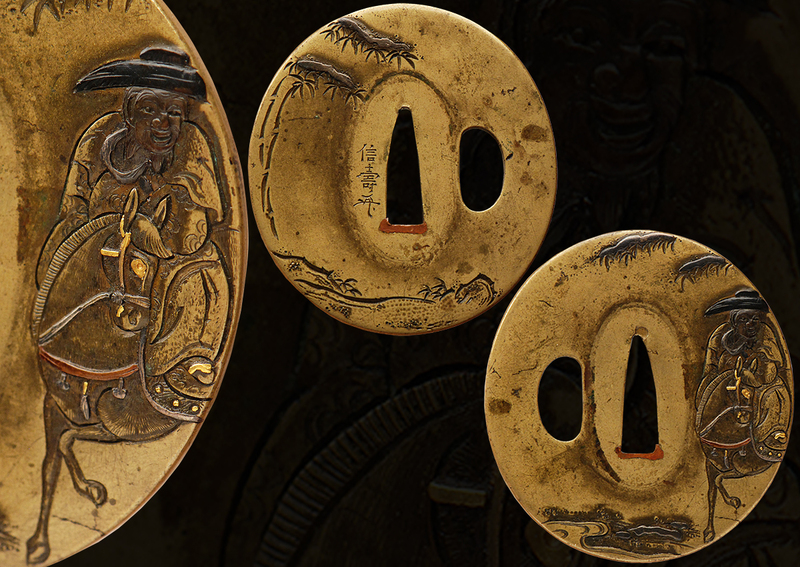 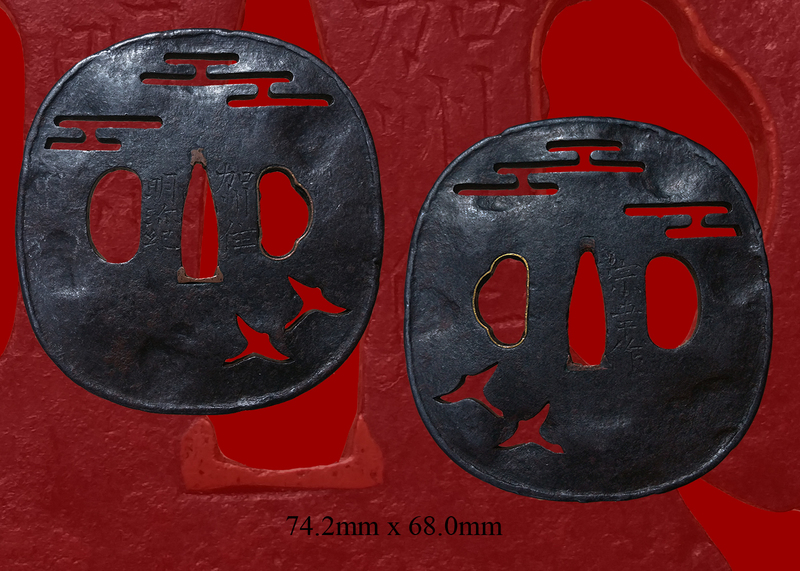 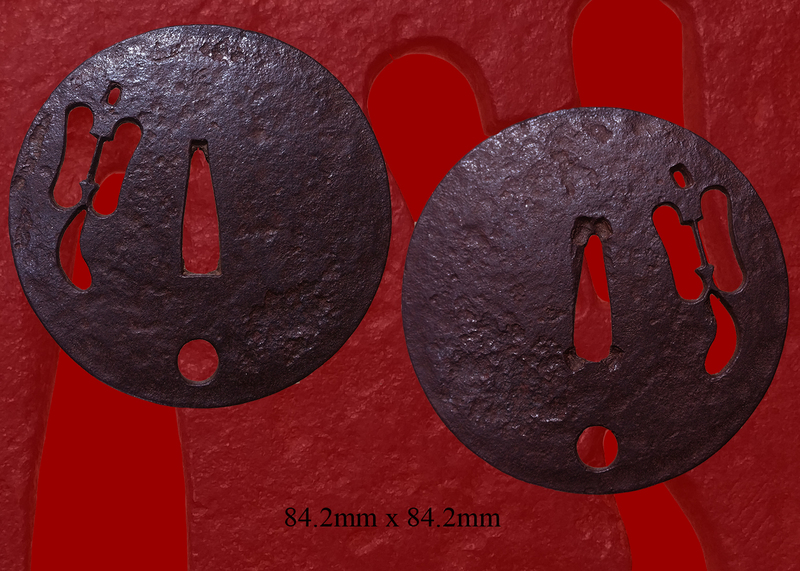 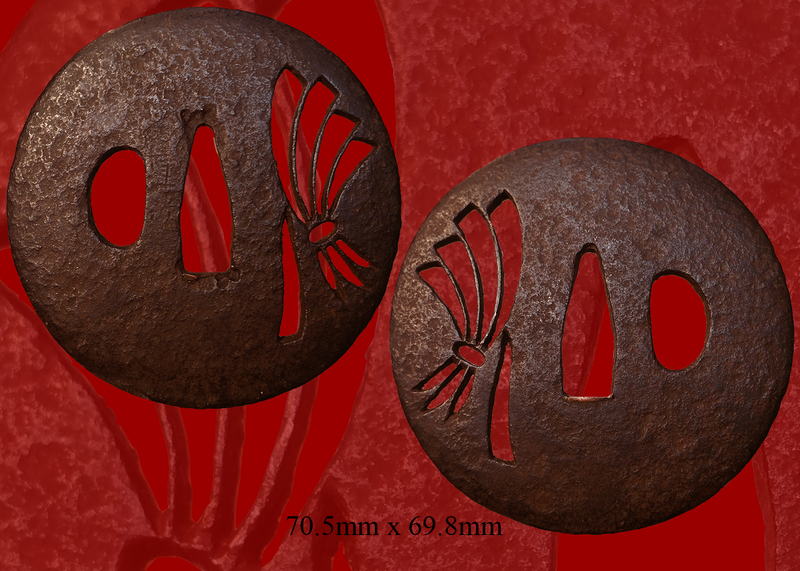 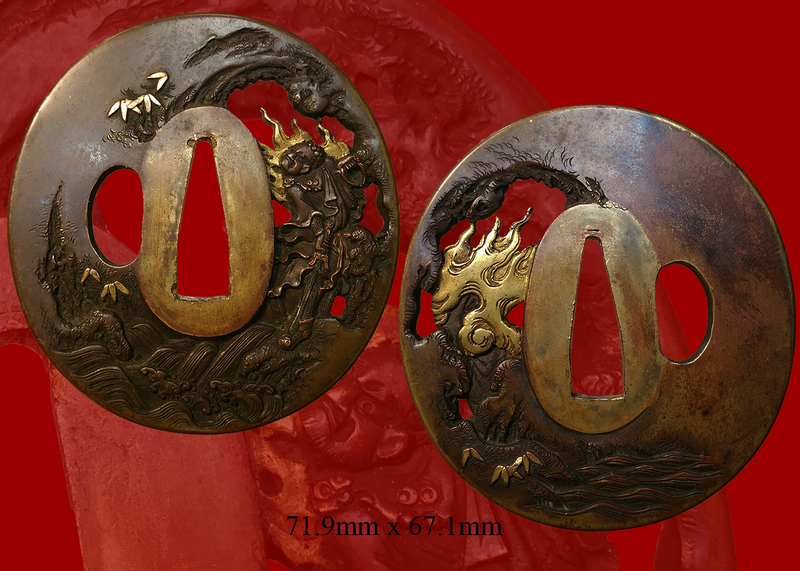 The wearing of daishō was limited to the samurai class, and became a symbol or badge of their rank. 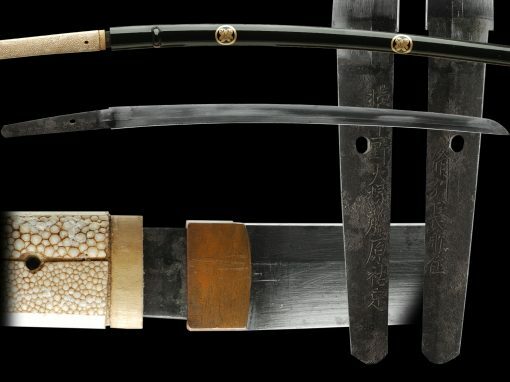 Daishō may have became popular around the end of the Muromachi period (1336 to 1573)as several early examples date from the late sixteenth century.An edict in 1629 defining the duties of a samurai required the wearing of a daishō when on official duty. 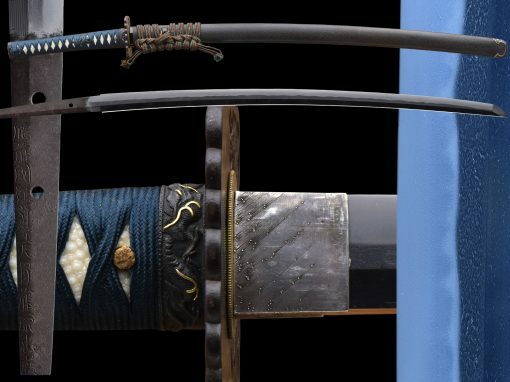 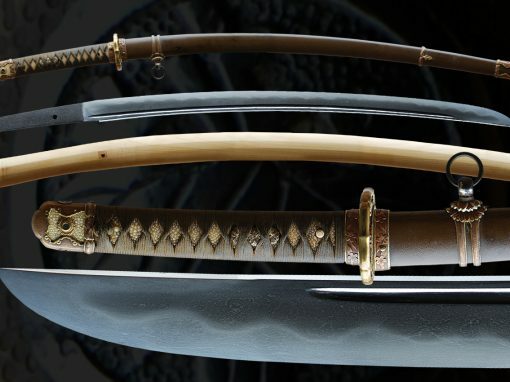 During the Meiji period an edict was passed in 1871 abolishing the requirement of the wearing of daishō by samurai, and in 1876 the wearing of swords in public by most of Japan’s population was banned; this ended the use of the daishō as the symbol of the samurai, and the samurai class was abolished soon after the sword ban. 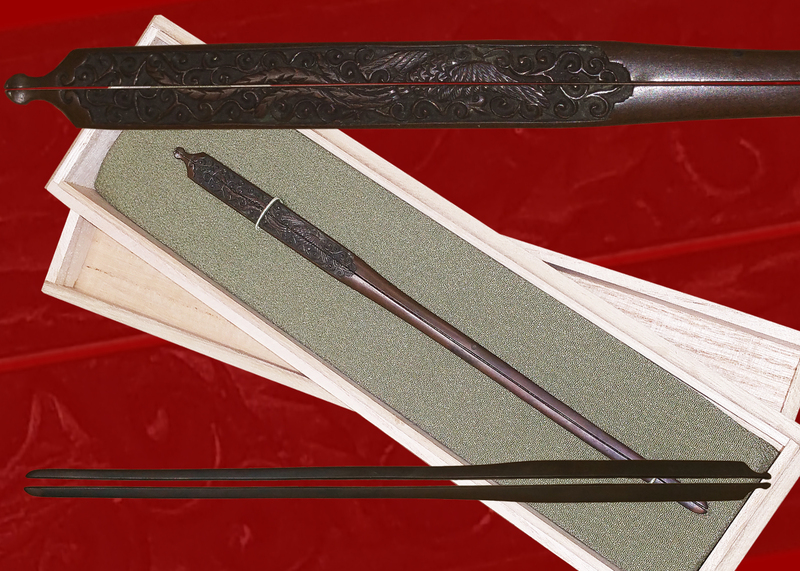 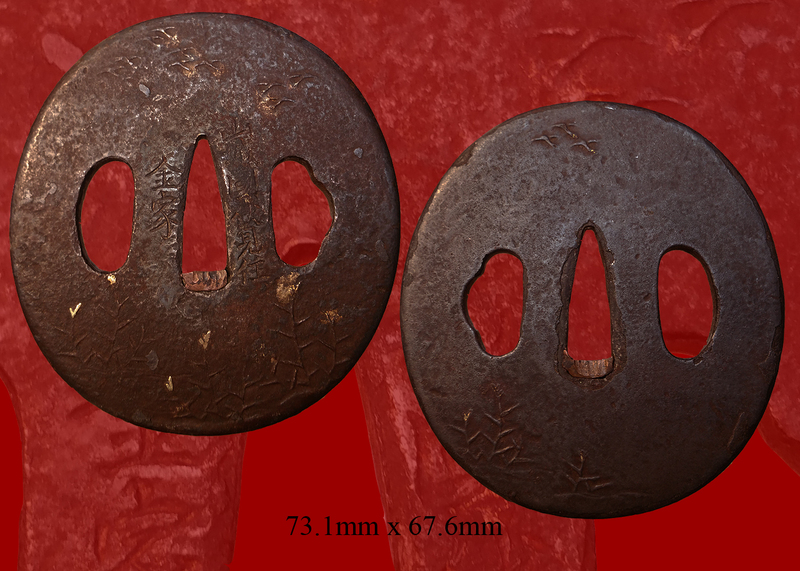 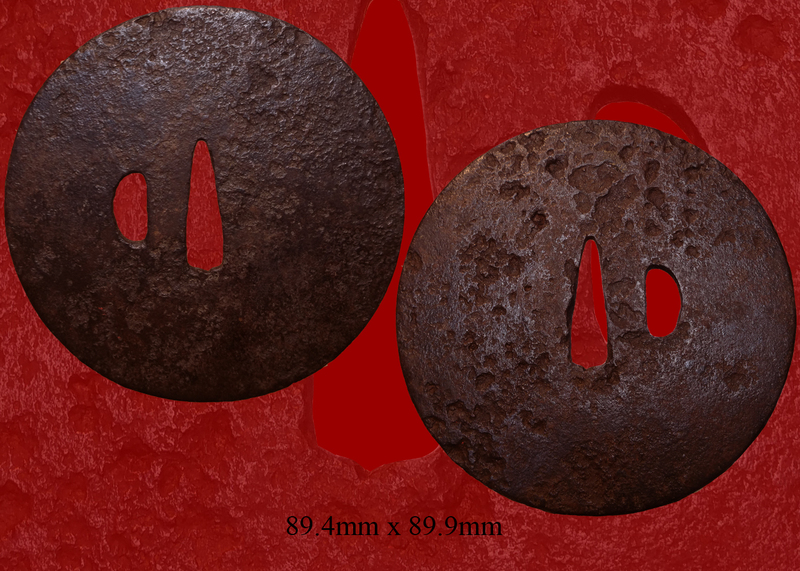 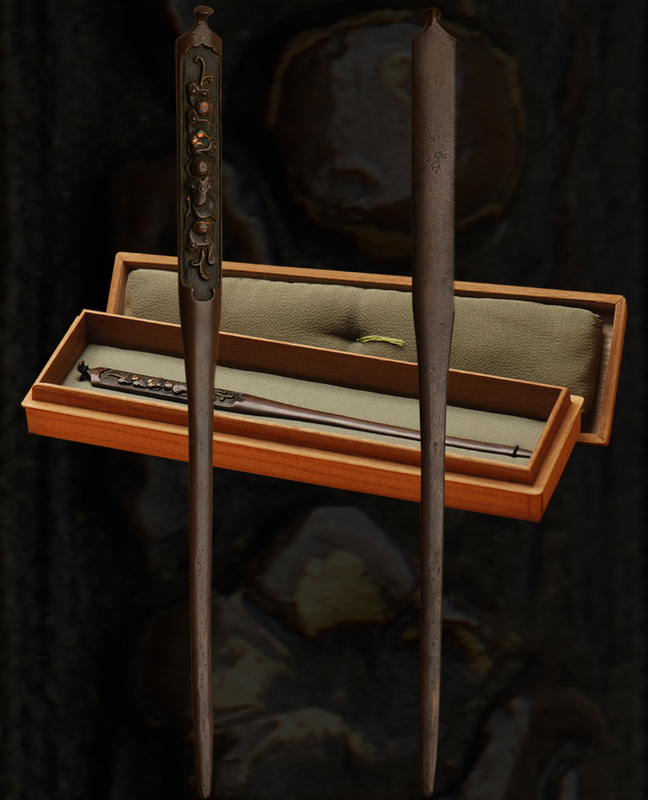 WE HAVE POSTED A WAKAZASHI BY THE SAME SMITH, THIS WOULD BE A GREAT PAIR TO MOUNT AS A DAISHO. 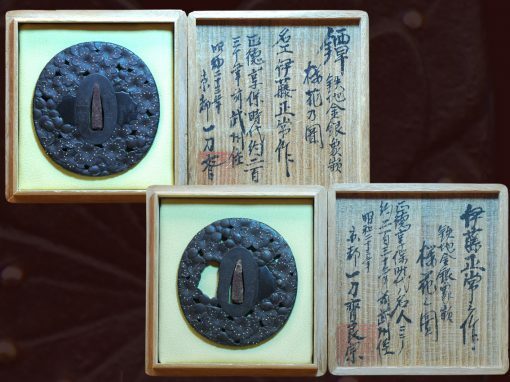 A POTENTIALLY GREAT PROJECT AND INVESTMENT. 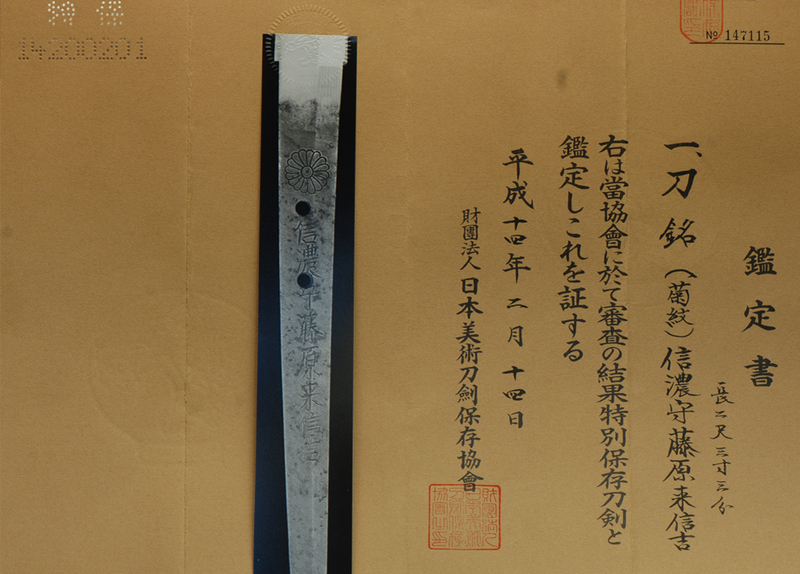 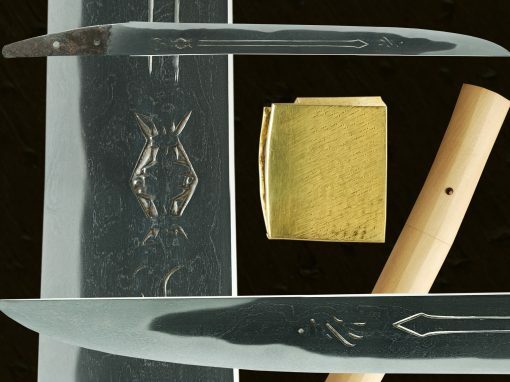 This blade bears a chrysanthemum crest, is of an excellent deki, and can be seen as a Shizu copy. 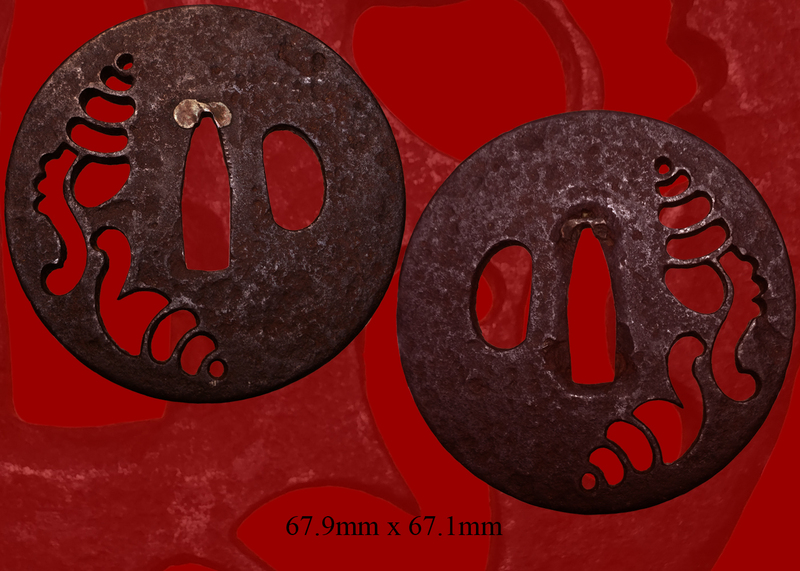 Email us if your interested in this item and remember to include the order number for this item: fss-706. 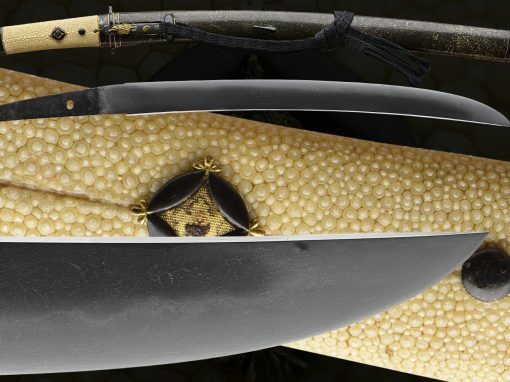 nagasa 2 shaku 3 sun 3 bu Migi wa tô-kyôkai ni oite shinsa no kekka, tokubetsu-hozon-tôken to kantei-shi kore o shô-suru.